Vaccines vanquished diseases. We shouldn’t go backward. 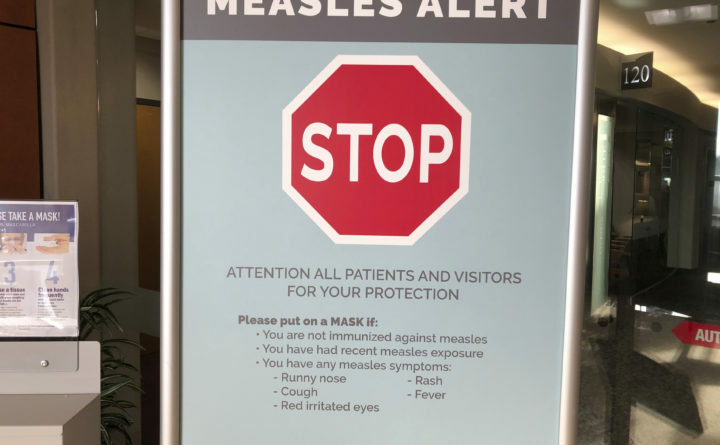 A sign posted at The Vancouver Clinic in Vancouver, Washington, warns patients and visitors of a measles outbreak. One of the most significant medical contributions of all time has been the development of childhood vaccinations. For decades, we’ve seen the virtual disappearance of many dangerous childhood diseases, such as polio, diphtheria, measles, mumps and rubella, and a significant decline in many others, such as pertussis (whooping cough) and meningitis. Indeed, the public health benefits of vaccinations have been substantial. However, in recent years, the anti-vaccination movement has gained momentum among parents who decline vaccinations for their children for fear of autism as a consequence of vaccines or possible harm from the components of the vaccines themselves. According to the American Academy of Pediatrics, these fears have no basis in modern science, and have been debunked time and again by numerous legitimate medical studies, which have failed to demonstrate an association between vaccines and autism. As well, we know that vaccine components are safe and have a proven record of efficacy. Despite this, data from the Centers for Disease Control and Prevention (CDC) indicate that we are seeing numbers of unvaccinated children gradually increasing nationwide. Even more alarming is the reappearance of diseases, such as measles. According to the CDC, measles was reported as eliminated in the U.S. in 2000. However, in recent years we’ve seen a resurgence of the disease, with more than 2,000 diagnosed cases just since 2010. Early symptoms of measles include cough, fever, red eyes, sore throat and runny nose, which could easily be mistaken for the common cold before the onset of the rash (typically three to five days later). Consequently, measles may go undiagnosed, but not before a person infected with the virus has potentially spread it to others. According to the National Center for Immunization and Respiratory Diseases Division of Viral Diseases, there have been reported measles outbreaks in New York, Washington, Texas and Illinois this year. Closer to home, an individual infected with measles traveled on a bus from South Station in Boston, to Manchester, New Hampshire, exposing not only the passengers on the bus, but also those at South Station, the city of Manchester and two stops in between. The ripple effect of this remains to be seen but is indeed frightening. Children under the age of 5 are at the greatest risk of severe complications from measles, which include pneumonia (the most common cause of death from measles in young children), encephalitis (swelling of the brain, sometimes leading to seizures and brain damage), and permanent hearing loss. Further, it is estimated that for every 1,000 cases of measles, one to two people will die. Prior to the development of the measles vaccine in 1963, the CDC estimates that there were 3 to 4 million cases of measles each year, leading to 450 to 500 deaths, 48,000 hospitalizations, and 1,000 cases of permanent brain damage from measles encephalitis annually. I think it’s important to ask ourselves if we are willing to see that happen again. There has been a level of comfort among those who elect to not vaccinate their children that they are protected by herd immunity. In order for herd immunity to be effective, it requires that 90 to 95 percent of the population be vaccinated. CDC data for the 2017-2018 school year estimate that several states reported vaccination rates for MMR (measles/mumps/rubella) among kindergartners at less than 95 percent, and some less than 90 percent. Data from this same report show that 94.3 percent of Maine’s kindergartners were vaccinated for MMR, which is a reduction from the previous year, reported at a rate of 94.9 percent. It seems evident that we are no longer able to rest on the laurels of herd immunity. Not all children are eligible to receive vaccinations (even if their parents want them) due to certain underlying chronic and serious medical conditions. Even healthy infants are particularly vulnerable, as they are unable to receive measles vaccination until they are 1 year of age, and are not fully protected by pertussis vaccines until after that time. Therefore, it’s critical that these susceptible children are protected from vaccine-preventable diseases by vaccinating the healthy children around them. As a group of health care providers that cares for children, we at Penobscot Community Health Care Penobscot Pediatrics believe that all children should receive all recommended vaccinations, and we support LD 798: An Act to Protect Maine Children and Students from Preventable Diseases by Repealing Certain Exemptions from the Laws Governing Immunizations. Donna Cotton is a family nurse practitioner with Penobscot Community Health Care.